I’ve recently had to use 3D and 5D Morton codes for spatial datastructure construction. Unfortunately I found that the material on the net actually describing how to encode, decode and interprete Morton codes is non-existent to shallow at best. The best sources I’ve found are wikipedia and an excellent blog post by Fabian “ryg” Giesen. This spurred me to create this blog post about my own experience with Morton codes and link to resources with more information. Morton codes provides an ordering along a space-filling curve while preserving data locality. Lets break that down a bit shall we? A space-filling curve is a curve whose range contains the entire N-dimensional hypercube enclosing your data domain mapped to discrete cells. 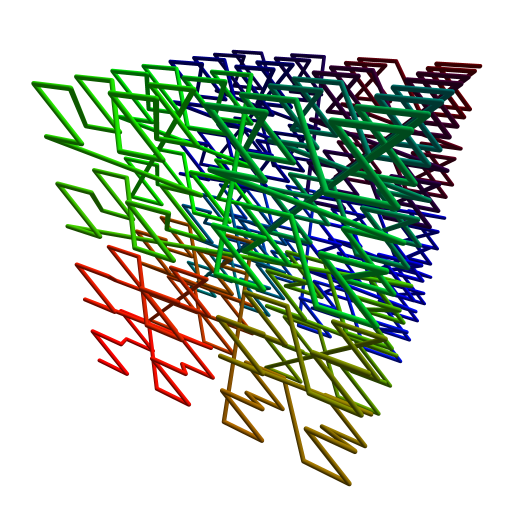 When working with 3-dimensional data the hypercube is usually just an axis aligned bounding box. What this all means is that the data is enclosed by the hypercube and that hypercube is then subdivided along each dimension, creating an N-dimensional grid, lets call that a hypergrid. 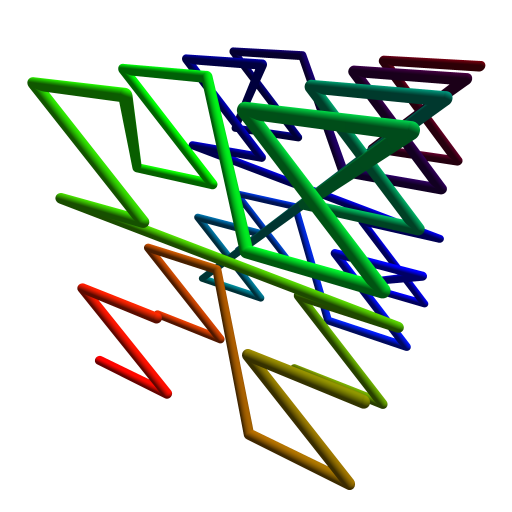 A space-filling curve that contains the entire hypercube is guaranteed to pass through each cell of the grid. A space-filling curve preserves data locality if similar data gets mapped within the same range on the curve. This means that a cell in the hypergrid gets mapped to a range on the curve and therefore all the data inside that cell gets mapped to a position inside that range. A good space filling curve will also map neighbouring cells close each other. Morton codes provides such a spatially local mapping. 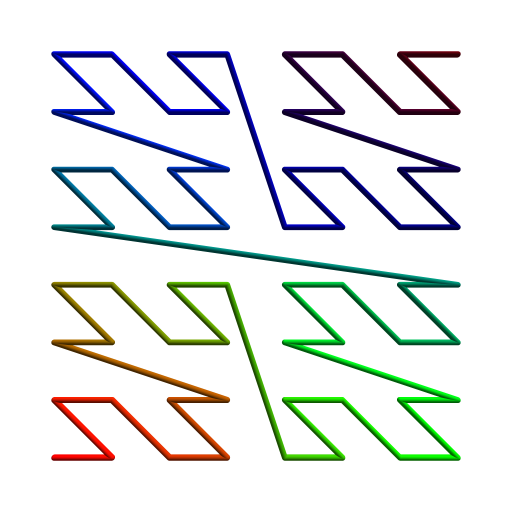 Below are three iterations of the Morton order in 2- and 3-dimensions, where each iteration adds a new subdivision to the cells of the previous iteration. Creating the Morton code for some data amounts to determining coordinates (x, y) of the data inside the hypergrid and interleaving those coordinates. 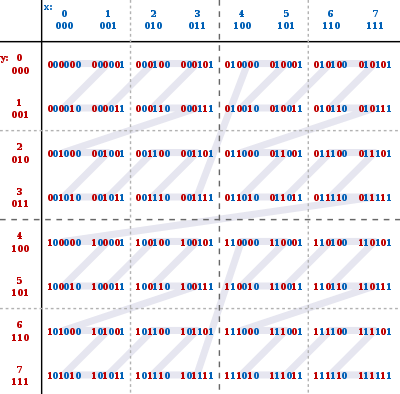 The figure below shows the Morton codes and curve in the 2-dimensional case with a 8×8 grid. Interleaving the binary representation of a cell’s coordinates yields the Morton code for the respective cell and connecting the cells in order of increasing Morton code connects the entire Morton curve. Implementing a function that can create Morton codes boils down to two problems: First seperate the least significant bits in c_x and c_y by N-1 and secondly combine them into a Morton code. The implementation that separates the bits via a classical Divide-and-Conquer approach looks like this. In the comments after each line you can see the position of the significant bits. Adapting the code to separate by two, three or four is pretty straightforward. Since I needed separation by 4 for a 5D ray representation I'll include that here. Once we are able to separate the bits in the coordinate's binary representation, interleaving the result to obtain the Morton code is a simple matter of bit-shifting and or'ing. Given a Morton code it can be useful to know which coordinates were used to generate it by deconstructing or decoding it. Doing this amounts to reversing the encoding, which is done by inverting the shifts and reversing the order of the masks, yielding the following functions. Using the CompactByN functions, we can construct a MortonDecodeN function similar to MortonCodeN seen above. Recently a lot of methods for creating acceleration datastructures for ray tracing have focused on using space-filling curves to speed up construction time, fx LBVH and HLBVH. The idea is simple: Map your multi-dimensional data onto the one-dimensional space-filling curve, sort the data according to its position on the curve and then create an acceleration structure on top of the cells. Due to the recursive nature of Morton codes, creating the acceleration structure is very simple. An interesting observation about Morton codes and acceleration structures is that the binary representation of a Morton code, m, can be interpreted as a traversal of an implicit binary tree to reach m's cell. The traversal is performed by looking at each bit in turn, starting with the most significant bit. 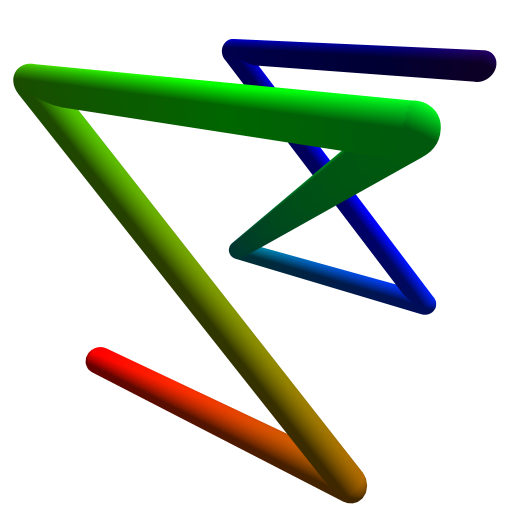 Each bit represents a splitting of the domain's data along the axis that the bit derived its value from. 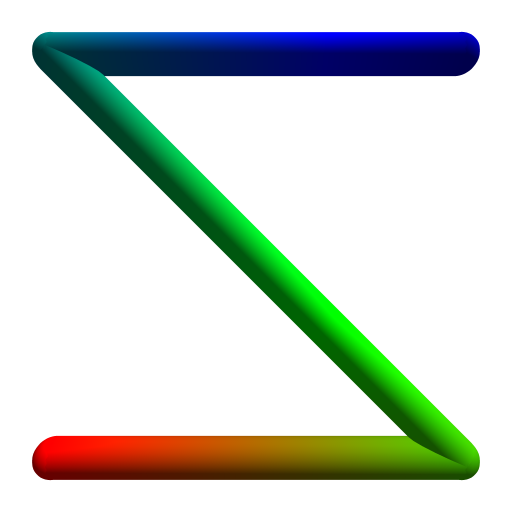 The value of the bit will then tell us which side of that splitting plane our traversal should proceed to, with 0 meaning we traverse the 'lower' child and 1 meaning the 'upper' child. This is best clarified by example so again we will look at the figure with binary Morton codes. Using cell (2, 3) as our example cell we are working with the Morton code 001110. Starting from the tree's root node, which spans the entire domain, (0,0) -> (7,7), the first bit 001110 tells us that our bounds should be split along the spatial y-median, between y=3 and y=4, and that the cell we are looking for is found among the lower numbered cells. Splitting (0,0) -> (7,7) along y's spatial median we get the new bounds (0,0) -> (7,3). where the last bounds enclose our starting cell (2,3) perfectly. Usually, knowing how to encode and decode Morton codes is enough to sort data and create acceleration structures around that data. 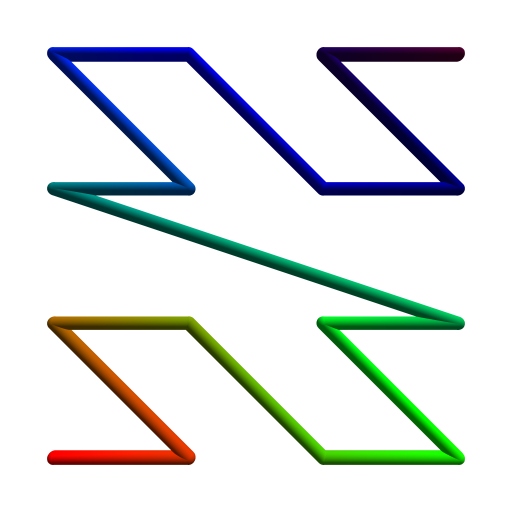 However, recently I've had to recursively assign geometry to a sorted list of rays, starting with assigning the geometry seen by all the rays to the root node and then recursively refine that for each child. In order to do that I found it helpful to do several things. Given two Morton codes, m0 and m1, determine the Morton code that encodes the minimum coordinates of both m0 and m1. Given two Morton codes determine the encoding of their maximum coordinates. Finding the Morton code that encodes the minimum coordinates of two Morton codes is trivial. // Decode the left hand side coordinates. // Decode the right hand side coordinates. // Find the minimum of the coordinates and re-encode. But we can do better! Decoding and re-encoding means doing a lot of bit-shifting instructions that we'd like to avoid. First, realising that we're not interested in the actual values of x and y, but rather the minimum of their encoded values is a tremendous help. Secondly, SeperateBy1 preserves ordering, so if X < Y then SeperateBy1(X) < SeperateBy1(Y), as long as X and Y are valid coordinates. Using this we can construct a Minimum function that avoids a lot of instructions. // Isolate the encoded coordinates. // Find the minimum of the encoded coordinates and combine them into a single word. Maximum can be constructed in a similar manner.